Joanne Berger-Sweeney, Ph.D., on Tuesday was named the 22nd president of Trinity College following a unanimous vote by the College’s Board of Trustees. 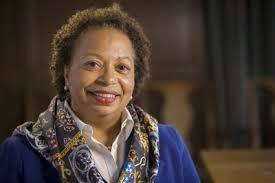 An accomplished teacher, scholar, neuroscientist, and administrator, Berger-Sweeney currently holds the position of dean of the School of Arts and Sciences at Tufts University in Medford, Mass., where she serves as chief officer for Tufts’ largest school, with more than 5,000 students. Berger-Sweeney, who holds a Ph.D. in neurotoxicology from the Johns Hopkins School of Public Health, has served as dean of the School of Arts and Sciences at Tufts since 2010. There she created the vision and set the strategic direction for the school. Berger-Sweeney came to Tufts from Wellesley College, where she served for 19 years as a faculty member and associate dean. Berger-Sweeney is the first African American and first woman to be elected president of Trinity. She will succeed James F. Jones, Jr. as president on July 1, 2014, following his retirement after 10 years of distinguished service. Thornburgh will become chair of the Board of Trustees simultaneously with Berger-Sweeney’s assumption of the presidency on July 1, 2014. As dean of the School of Arts and Sciences at Tufts, Berger-Sweeney managed a broad set of responsibilities, including oversight of undergraduate admissions, athletics, undergraduate and graduate students, the graduate school, communications, and academic and administrative deans. As dean, she launched several undergraduate and graduate academic programs and a Center for the Study of Race and Democracy; initiated an interdisciplinary cluster hiring program for faculty; collaboratively developed guiding principles for the school; initiated a summer bridge program for liberal arts students transitioning from underserved high schools to Tufts; and advanced fundraising initiatives for the school, among other accomplishments. Before Tufts, Berger-Sweeney was a member of the Wellesley College faculty, which she joined in 1991 as an assistant professor in the Department of Biological Sciences, and rose through the ranks to become the Allene Lummis Russell Professor in Neuroscience. Her teaching and research career at Wellesley spanned 13 years prior to being named associate dean in 2004. As associate dean, she oversaw 20 academic departments and programs in addition to her teaching and research. She received her undergraduate degree in psychobiology from Wellesley College, an M.P.H. in environmental health sciences from the University of California, Berkeley, and a Ph.D. in neurotoxicology from the Johns Hopkins School of Public Health. She completed her postdoctoral training at the National Institute of Health (INSERM) in Paris, France. Berger-Sweeney is the recipient of numerous awards and honors, including the prestigious National Science Foundation Young Investigator Award and a Lifetime Mentoring Award from the Society for Neuroscience (2006). She is a Fellow of the American Association for the Advancement of Science and chairs the professional development committee of the Society for Neuroscience. She is on the Board of Directors for AFS Intercultural Programs/USA and is trustee and chair of the academic affairs committee for Framingham State University. Berger-Sweeney and her husband, Urs V. Berger, Ph.D., also a neuroscientist, are the parents of two children: Clara, age 17, and Tommy, age 13. Berger-Sweeney was selected from an extremely well-qualified applicant pool following an extensive national search conducted by a 14-member committee composed of students, faculty, staff, alumni and trustees. The search committee was advised by Storbeck/Pimentel & Associates, a nationally recognized firm that has conducted more than 1,800 high-level searches during the past 20 years.